Need a fun snack idea? Your kids will love this idea for a cute mini cookie sandwich! 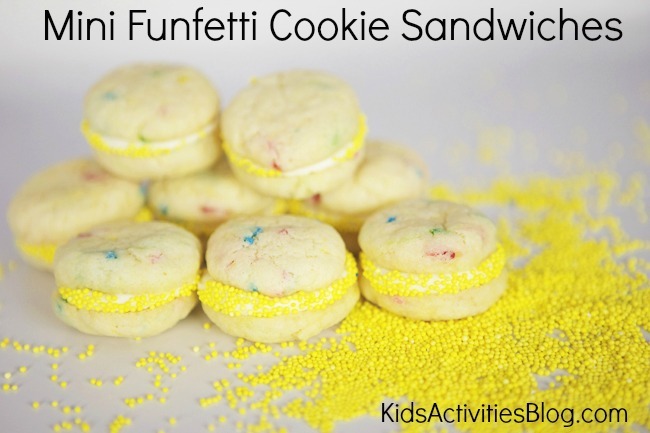 Kids Activities Blog loves sweet treats and hopes you enjoy this cute Funfetti recipe idea. Pillsbury boxed funfetti cake mix has endless possibilities beyond just baking a cake. My kids all-time favorite cookies to make are funfetti cookies. Using the boxed cake mix as it’s main ingredient makes them quick and easy, perfect for little hands to play baker while helping mama. We are always searching for new twists on old favorites, this is where these fun mini cookie sandwiches enter the picture. What better way to eat a funfetti cookie that to sandwich it with frosting! These are perfect for a Princess themed tea party or your next birthday party. Preheat oven to 375 degrees. Combine the Funfetti cake mix, oil and eggs until thoroughly moistened. Using a teaspoon, shape dough into balls and place about 1″ apart on ungreased cookie sheet. Gently press down on top of each ball to slightly flatten. Bake for 6-7 minutes or until edges are golden brown. Cool one minute, transfer to a rack to cool completely. Fill a pastry bag or ziplock bag with frosting. Pipe the frosting to the flat bottom of half of the cookies. Use remaining cookies to top and make the cookie sandwich. Roll each sandwich in jimmies or sprinkles. Enjoy! What a super fun recipe that is easy and perfect for kids to help with this summer! Love it. Yummy. Mouth watering. I would like to teach these steps in my kids’ kitchen class. Thanks for the idea. I will let you know about my output.